Opinion discourse can be regarded as an encounter of different, partially contradictory relationships between discourse participants constructed through the editorial voice. The author tries to establish a consensus over the negotiated matter with the reader, while at the same time claiming authority over the correct description and evaluation of an event. One very polarizing topic is the issue of global surveillance and whistleblowing. More intriguing, however, is the way editorialists get their opinions across. To what extent does the social context of a news culture influence the selection of topics, the perspective and the expression of opinion? 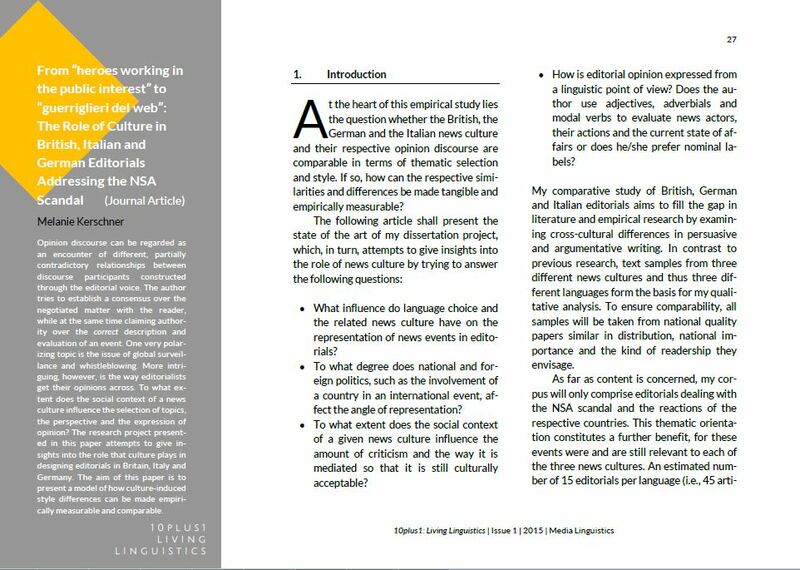 The research project presented in this paper attempts to give insights into the role that culture plays in designing editorials in Britain, Italy and Germany. The aim of this paper is to present a model of how culture-induced style differences can be made empirically measurable and comparable. Melanie Kerschner is lecturer at the University of Salzburg (Austria) in the Department of English Linguistics where she studied English and Italian. Her current dissertation project focuses on culture-induced style differences in European opinion discourse. Her research interests lie primarily in media linguistics, particularly the contrastive analysis of newspaper articles in diverging linguistic and sociocultural contexts. Other areas of interest include corpus linguistics and sociolinguistics, especially the linguistic diversity due to differing cultural backgrounds, language change in contact languages and pidgin and creole studies in general.